Would you look at that? The garden has gone wild! To enter one must blindly reach through the blackberries to the latch on the gate and, once the latch is found and opened, duck underneath the new growth that won’t bear fruit until next summer. 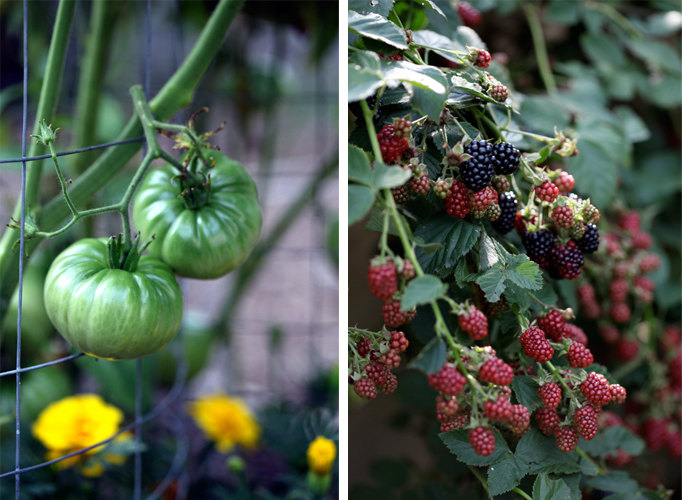 Tomatoes have broken free of their cages, the strawberries are taking over our pathway, herbs are spilling out of their raised bed and the blackberry bush has exploded with just-ripe fruit. Once inside you embark on what feels like a treasure hunt, pecking through the ever-bearing strawberry patch for the tiny, sweet fruit and pulling blackberry branches aside to reveal purple berries as big as my thumb. The tomatoes are plump and just starting to ripen, moving from a deep apple green through shades of yellow, peach and pink before finally settling into deep rosy reds (romas and brandywine), golden yellows (hawaiian pineapple) or dusty purples (cherokee princess). The cucumber vines have been prolific, providing us with more bounty than we’ve been able to handle, and the okra is just starting to bear its strangely-shaped pods. We’ve definitely moved from spring crops into summer, having already said our goodbyes to the sugar snap peas and lettuces and stored away the last of the spring onions. The crop we've been enjoying most recently, the one that bridged the gap between spring and summer and would have provided a harvest for even longer if we'd just planted another succession, are the red beets. 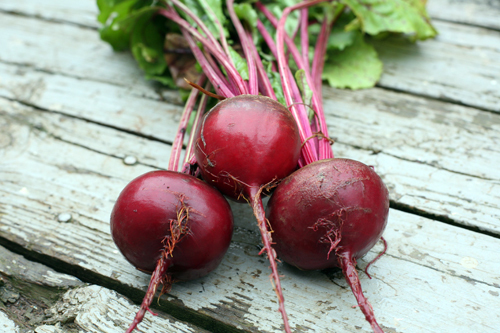 Beets are a newly acquired vegetable on my list of top ten favorites. I was introduced to them just a year or two ago, in the roasted form and mixed with a medley of potatoes, carrots, pearl onions and brussels sprouts. Having only had experience with the canned and pickled varieties in the past, I was pleasantly surprised when I took my first bite of fresh roasted beet and discovered its delightfully sweet flavor and firm texture. Ever since, beets have made it into most of our roasted veggie dishes and made select appearances in salads containing goat cheese and toasted nuts. 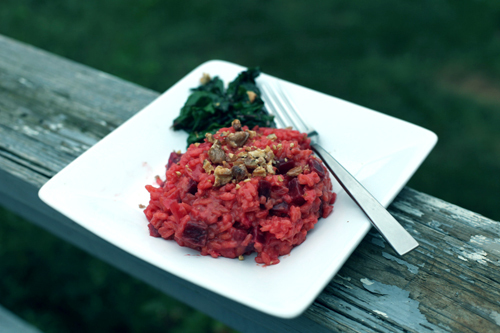 Most recently I tried beets in a creamy risotto, and was extremely pleased with the final result. I based the recipe on a butternut squash risotto that I've been making for many years, thinking that the beets would make an easy substitute in level of sweetness and overall texture. 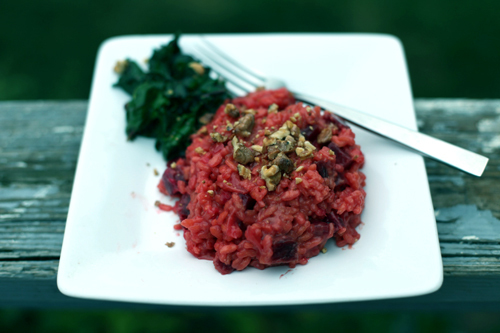 The beets do take longer to tenderize than butternut squash, so my method resulted in a creamy risotto with bits of slightly firm beets. If you'd prefer your beets to be very soft, I suggest roasting them with a splash of olive oil for 10-20 minutes before adding them to the skillet. Oh! And if you're lucky enough to purchase (or grow!) beets that still have their greens attached, and those greens are still crisp and brightly colored, cook them up like you would kale, swiss chard, or collard greens. They are delicious. I think that barley would be a fantastic whole-grain substitute for the arborio rice in this recipe, we were just all out. Make sure to use pearl barley if you try it - quick-cooking barley doesn't allow for the slow release of the starches that provide the creaminess risotto is known for. In a large skillet with tall sides, heat the olive oil over medium heat. Add the onion and beets and cook until the onions ahve softened and translucent, about 8 minutes. Add the rice and stir with a wooden spoon until toasted and opaque, 3-4 minutes. Add the wine to the toasting rice and then add a 1/2 cup of stock. Cook, stirring constantly, until the liquid is absorbed. Continue adding stock by 1/2 a cup at at time, waiting until the liquid is absorbed before adding more. Cook until the rice is tender and creamy, yet still a little al dente, about 20 minutes. Stir in the butter and cheese until well mixed. Serve immediately with toasted walnuts crumbled on top. Interested in reading other posts about our garden?